So, I spent the morning celebrating (?) the onset of summer by floating around in my swimming pool. After my 12-year-old son fished a field mouse out of the water, chased me and his little brother around with it, then tossed the corpse over the fence, that is. It took me awhile to get used to the *chilly* water (especially since I kept imagining what else might be bobbing around beneath me), but the warm sun/cool water combo felt awfully nice. Now that I'm all refreshed, though, I feel like Hopping around inside my nice, air-conditioned house. 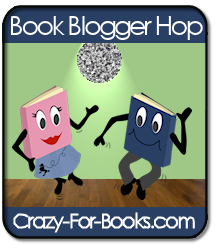 If you feel like joining me (and you know you do), click on over to Crazy For Books to get all the details on this fun, weekly event. Since I don't like this week's question - it has to do with choosing your favorite blog post and explaining why it's dear to your heart - I'm going to ask you one of my own. It's a little bit generic, but I really am curious: What are y'all reading this summer? Which upcoming titles are you most excited about? - I've got all kinds of books to read for tours, but as soon as I have a spare minute, I'm going to delve into City of Fallen Angels by Cassandra Clare, Crossed by Ally Condie (as soon as my ARC gets here, anyway), and Carol Lynch Williams' new one, Miles From Ordinary. Whether you're coming by from the Hop or you hang out here all the time (God bless you!) or you just happened to stumble across my blog, thanks! I hope you'll stay, look around and leave me a comment or two. I promise to return the favor. Oh, I'm so Jealous! It's been way to cold here in boring old Utah to even fill our pool. Sigh! I'm embarrassed to admit that I haven't even started the Mortal Instruments or Matched, but plan to. Thanks a lot! I am freezing right now...can't believe it's June 3rd because it feels more like November! Really miss AZ right now. I like this week's question. I still don't want to get in our pool at home, but I'm beginning to think the tx heat is gonna warm it up. I always have a hard time deciding what I want to read next. I sit in my floor for an hour or so looking at the books and the back of them thinking what sounds interesting this time. Way too many books to list. My summer reading list is HUGE!! There're so many books I'd love to read. Stopping by for the hop and to say thanks for stopping by and saying hello today. I hope you have a lovely weekend! I thought that City of Fallen Angels was okay, but not as good as the first three books. Admittedly, I haven't read Matched yet - so I guess I'll be reading that this summer, too! Thanks for stopping by. :) This summer I will be reading a lot of books that I purchased last month (such as Enticed, Wondrous Strange, Darklight, Beautiful Creatures, Born at Midnight, etc.). I'm also supposed to have books on the way from Heather Terrell for review, but they haven't arrived yet. Add to that all of my Netgalley reads and I'm in for a busy summer! Thanks for stopping by Reading Lark! Cute blog - I'm a new follower! I'm reading real old book right now. The Man Who was Thursday. I've never read it before, and I'm enjoying it. Susan, don't pretend you don't LOVE the fact that here in AZ we get to jump in our pools in May! *giggles* Okay, I try to promote Arizona love whenever possible, just like my hubby tries to promote love of Albania (which I find not that loveable in many aspects). I'm glad that your son fished out the mouse, those things give me the willys. And, as for books I'm looking forward to...*ponders*...possibly FOREVER by Maggie Stiefvater and Supernaturally by Kiersten White. Hopefully they'll be in my hands soon. Great question!--And I LOVE all your answers!!! New follower--thanks for hopping by my blog!